Domaine Chandon is a Napa Valley winery now owned by a French company. The setting is both beautiful and upscale. The winery features a Michelin-starred restaurant, étoile, that naturally features seasonal, regional food. The Domaine Chandon Cookbook offers 75 of the premium recipes from this restaurant with its particularly sparkling view. Of all those recipes, this one is my favorite. 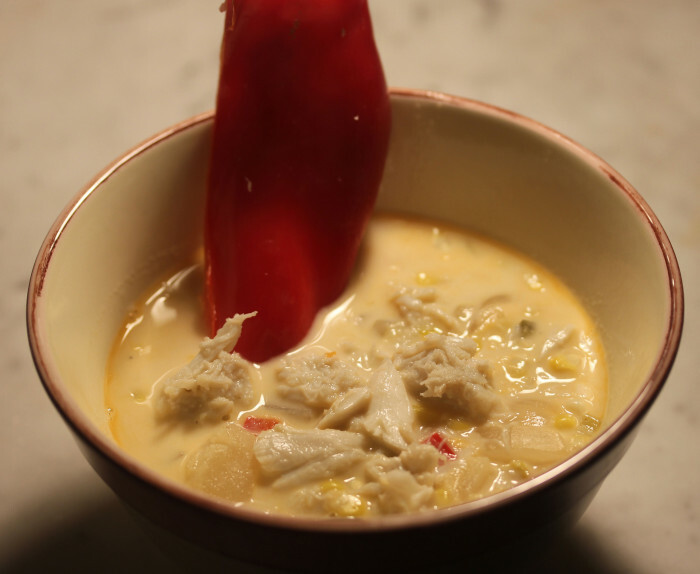 Corn and crab seem to be one of those natural food marriages that can always be loved and almost certainly never surpassed. I know it’s summer, and it’s hot, so the idea of a warm soup may seem peculiar. But on the warmest of nights, everyone will sigh in delight at this bisque where both corn and crab flavor offer their distinct notes. If you make this dish, consider doing it a day ahead if you want the crab flavor to evolve even more. I used canned crab from my good, local market. It seemed to need that extra day for its full flavor to emerge. Since this recipe comes from a sparkling wine producer, the obvious pairing here is a glass a sparkling wine. And then? Perhaps a lamb chop and potato gratin. This bisque is strikingly elegant and deserves matching dishes of exceptional quality. And where would you find a good gratin recipe? Why Domaine Chandon has a three-cheese potato gratin, soon to be tested by Suzi and blogged by me. In a small sauté pan or frying pan over medium-low heat, combine the1/2 cup chervil leaves with the 1/2 cup olive oil and cook, stirring occasionally, until the oil is hot and small bubbles around the edges, 3 to 5 minutes. Remove from the heat and let stand at room temperature for 1 hour. Strain the chervil-infused oil through a fine-mesh sieve and reserve. Discard the chervil. In a soup pot, heat the 2 tablespoons olive oil over medium heat. Add the leek and sauté until soft, about minutes. Stir in the onion, garlic, and jalapeno. Sauté until the onion is translucent, about 3 minutes. Add the potatoes and bell pepper and sauté for 3 minutes longer. Add the stock, clam juice, wine, and 1 teaspoon salt and stir to mix well. Raise the heat to high and bring to a boil then reduce the heat to low, cover, and simmer until the potatoes are tender, about 10 minutes. Meanwhile, cut the kernels from the ears of the corn. Add the corn kernels to the soup and simmer until the corn is tender, about 5 minutes. Add the crab and cook for 2 minutes to heat through. Stir in the cream and remove from the heat. Season with salt and pepper. Ladle the bisque into warmed bowls. Swirl 1/2 to 1 teaspoon chervil oil into each serving and garnish with the 2 tablespoons of chervil leaves. Serve hot. Photo Credit: Canon T2i, EFS 18-55mm Macro lens, F/2.8 for 1/80th second at ISO 160.